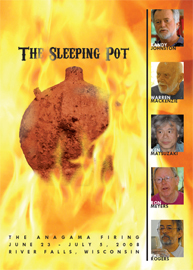 In late July 2008, five world renowned artists gathered in River Falls, Wisconsin for a two week firing of the McKeachie-Johnston Anagama kiln. In this amazing DVD, witness the enjoyable yet painstaking process of loading, firing and unloading an Anagama kiln. In the process see a community of artists from all over the world come together to share their love of the craft. In addition to the firing, view demonstrations and candid dialog between the guest artists: Randy Johnston, Warren MacKenzie, Ken Matsuzaki, Ron Meyers and Phil Rogers as they share their technique, esthetics and philosophy in the pottery studio of Jan & Randy McKeachie-Johnston.